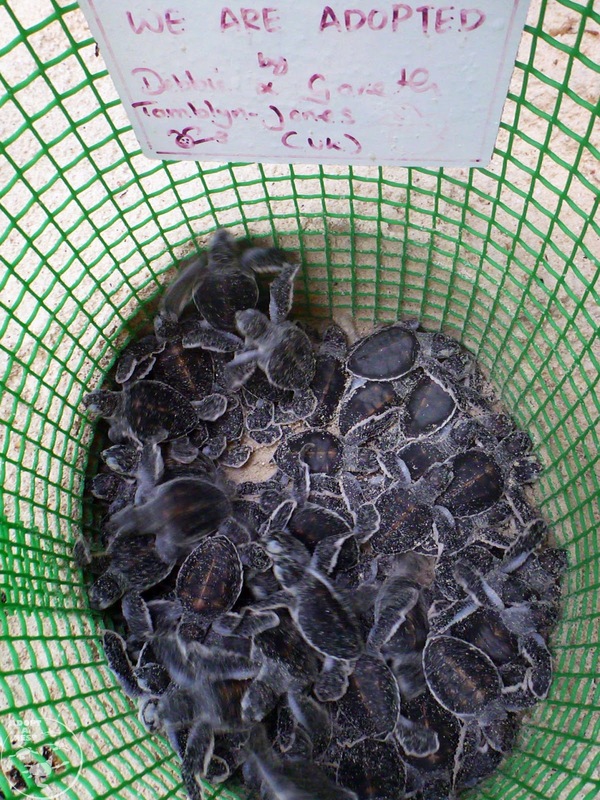 Adoptive Mummy to 76 healthy babies! We've been waiting for this email. We knew they were due any day and yes we have been expecting them! Here they are. 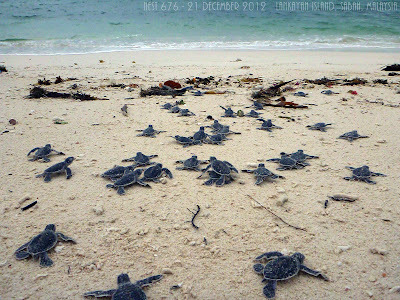 76 baby green turtles. Time flies! Two months have passed since your visit to Lankayan and there’s only a few days left in 2012! How’s life treating you? Remember the nest you’ve adopted at Lankayan in October? 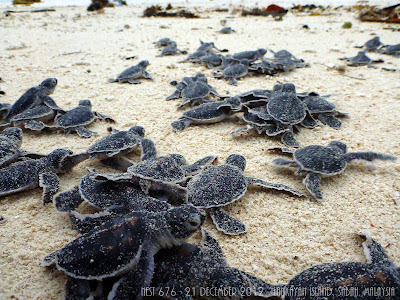 We hope this is included in one of the great things happened to you in 2012 And now there’s another great news--the babies hatched! Please do not hesitate to contact me if you need more information. Also, we are happy to hear from you for any comment or suggestions to help us improve our works here. We are more than honoured and privileged to have been a part of this amazing programme. The Reef Guardians of Lanakayan do amazing things. I admit I had tears seeing the pictures of our little babes scurrying urgently towards the water. They have a perilous journey ahead, we wish them God speed and if only one reaches adulthood to procreate again then that would have been an amazing result. We are so happy we could help them get this far at least. Indeed, one of the best things that happened to us in 2012. Now seriously you don't have to be a cricket fan to enjoy the Boxing Day test at the MCG. It is a brilliant day out and I defy anyone not to be swept up by the fun, goodwill, humour and excitement. The train into the city was packed. Grandfathers, fathers and sons, generations of families come together once more to enjoy a great tradition here in Melbourne. Plenty of mums and Grandmas too! We were joined by our friend Simon. Even the walk to the ground was exciting, throngs of people striding purposefully and the buzz of excitement crackled among us like electricity. The first beer was consumed at 10.45. The boys packed away plenty more thereafter. Australia were on form bowling Sri-Lanka all out for 150 runs. The crowd was in party mood. By 3pm I left the boys to it. So they could be boys and heckle and banter and of course drink more beer. I had a little boy back home I needed to attend to. I finally received a slurry message that the boys were on their way home at about 6.30pm. Then I got another one to say they were in the pub! I got myself round there and rescued Simon (who looked more Aussie than an Aussie!) from an extremely drunk punter. Finally we all got home. The BBQ was lit and much silliness ensued. Including lots of singing (badly) and lots of dancing (even worse). "Take that camera out of my face!" says Hubster. "Really? You saying I look silly?" All in all it was a FANTASTIC day and Hubster albeit a rather wobbly chef, rustled up some great tucker for us all. So Howzat for a great boxing day to remember. Merry Christmas one and all! Mercifully it was a 22-er and not a 39-er. First of all a few things to note. The bin men came and emptied our bins like any normal Tuesday. Admittedly they drove around the streets like lunatics! I suppose in the heat they can't leave rubbish lingering. All the pubs are closed. All the trams, trains and buses are free, should you be stuck for anything better to do. Soon after rising and right on cue we had a very welcome call from home. We hit the dog beach and Radders had a blast with a whippet called Wilbur. I wore a silly Santa hat, I was the only one. Spot the Brit a mile off eh? Back at home Hubster cracked a bottle of "Man o War" sparkling and we indulged in smoked salmon, creamy scrambly eggs and goats cheese infused with dill. Then it was pressie time and Radders got fully involved in the proceedings and enthusiastically unwrapped his gourmet doggie hamper. So far he has eaten his "Santa Paws" biscuits. I was more than thrilled with my new camera and had a good chuckle at the joke pressie of Paxo stuffing, Bisto gravy and Bread Sauce mix! We got suited and booted and went to The Baths Restaurant for Christmas lunch. I felt very Audrey Hepburn wearing a beautiful silk scarf, a pressie from a dear friend back home. We were both more than delighted when we saw Turkey and all the trimmings on the menu. It is not a guaranteed option here and looking around, the beef and barramundi were the most popular choices. King prawns with marie rose to start and a delightful Christmas pudding sponge with creme anglaise with brandy to finish. It made our day - much more traditional than we ever imagined. Oh and a surprise visit from FC himself. Back home, we climbed into our "comfies", Hubster and I snuggled up on one sofa, whereas Radders had one to himself! We all snoozed, watched rubbish TV and finished off the sparkling from earlier. Some things don't change. More calls, emails, texts and skypes were made and received from back home, it was all a bit of a mad flurry. Then it was soon time for us to draw a close on our first Christmas Day in Australia. As we climbed into bed, we thought of everyone back home who would now be starting their Christmas Day, they had never been far from our thoughts. Our own day had exceeded our expectations. However, it really isn't about the pressents under the Christmas tree but it is all about those seated around the table.....and there were a few missing! As we bid goodnight, we both admitted we were relieved the day was done and acknowledged we had also done our very best. You may not understand that feeling but if you are an ex-pat away from home, you will get it completely. Now Boxing Day we are hugely excited about! MCG - bring it on - Howzat! In years gone by Christmas Eve was a foregone conclusion. Either making merry in our local pub or making merry with family in Hay on Wye. This year we headed into the City. We saught out a couple of roof top bars. We headed to Federation Square for Carols by Candlelight. We came home and opened our Christmas cards to each other. I got my first one from Radders, that boy is growing up fast. We sat around the tree with a final night cap, watched some TV and bid goodnight to our first Christmas Eve in Australia. What will Christmas Day bring? A new experience entirely, a first to remember and let's face it, 2012 will go down as a year of many of those. Today, 23rd December, was the hottest of the year so far, clocking 39 degrees and not a breath of wind. We stumbled across a fabulous farmers market at St Kilda and admittedly made some sympathy purchases on the basis that these poor people were melting whilst selling their wares. A kilo of organic black cherries $10 - bargain. They are $40 a kilo in the supermarket. We then did the supermarket shop. Smoked salmon, avocados, mangoes, cheeses, pate, smoked duck, pickles and chutneys and all sorts of delicious delectables and luxury things that you only allow yourself to indulge in at Christmas. No chocolate however, how incredibly restrained of us. That evening we got on our bikes and hit the beach front. At 7.30 it was still 30 degrees and the beach was buzzing with family gatherings and cool box (Esky) picnics, BBQ's and games of volley ball. Many were wearing santas hats or reindeer antlers. We headed towards the open air cinema on the beach front at St Kilda. We had "Gold" tickets which entitled us to a great view, a huge comfy bean bag and some free Ben & Jerry's ice cream. We took a flask of chilled wine, shared a mini fish & chips and listened to a guy with a great voice on an acoustic guitar entertain whilst the auditorium filled. It was a beautiful evening, the sun slowly ebbed away and we sank back into our bean bags to watch a great film, The Intouchables. We rode home at about 11pm, the front was still now, all the families had gone, there were just a few groups of young people and young lovers sat on the sand watching the gentle waves lap at the water's edge. One group had a bubble pipe - how very St Kilda. Well this certainly isn't our usual run up to Christmas Day, it was however one that will live long in our memory. I think I could just be getting into the swing of this "Aussie" Christmas after all. 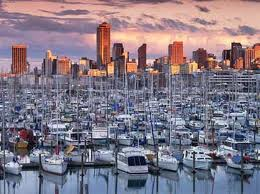 I was very excited about this trip to the "City of Sails" which is a very apt reference as I have never seen so many yachts in one place. It surely has to be one of the biggest marinas in the world. 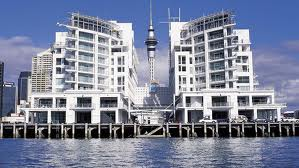 I remember seeing a Michael Palin programme set in Auckland and noting how beautiful it was. Never in my wildest dreams did I think I would have the chance to visit. Once again it was on my Dad's list and once again I felt he was with me perched on my shoulder. Hubster has got quite used to me muttering to myself as we see the sights, he knows I'm talking to Dad. We stayed in the Hilton which has the best location of any hotel in the City. We had a harbour view room with a huge balcony, it was perfect. I love this city because it is real. As well as the swanky bars, harbour side restaurants and real estate there is a very active working port. Among the luxury sails are tug boats, freight and cargo ships toing and froing busily. The weather was a very pleasant 25 degrees and as usual we packed a lot into our weekend. The sky tower gave us incredible views over the City but I wasn't brave enough to stand on the glass floor - it's a long way down! As ever we enjoyed some fabulous seafood and delicious wines not to mention some of the most plump and juicy oysters I've ever had. We took a ferry out to the surrounding Islands of Devenport and Waiheke and were stunned by their beauty. Waiheke was breathtaking boasting no less than 30 vineyards nestled in its undulating landscape. The wine tasting was sublime. I love these little voyages of discovery that we share together. It gives me so much pleasure to see my Hubster relax and kick back and I just love hanging out with my best friend. We laugh and talk, we tease each other, well actually Hubster teases me relentlessly and I treasure these carefree times just for "us". It was a truly magical weekend and our love affair with New Zealand is in full throes and on our last evening we were presented with this beautiful sunset. PSSST.... I'm saving the best till last. We ONLY saw a Kiwi, in the scrub on Waiheke Island. These birds are so shy and elusive and mostly nocturnal that even New Zealanders admit to only ever seeing one in a zoo. How special was that? I admit to having tears!